There is definitely something about fabrics from the 50s and 60s that really appeal to me – particularly big bright florals. 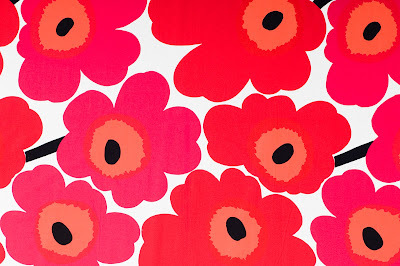 I was 4 or 5 when I first came across the bold patterns and colours of marimekko fabric. It was in the ‘sun room’ at my little friend Ella’s house. The walls were painted the sunniest of yellows and the big feather filled sofas were piled high with the most gorgeous cushions upholstered in vibrant marimekko fabrics. Its funny isn’t it how you remember things. For me my memories are often visual – the way things were positioned, the colours or pattern of an object, the way fabric moved in a dress or the texture of one thing in contrast against another. The memory of Ella’s house and of particular rooms in it – had such a strong impact on me – the memory has remained. In my early 20’s when I studied Interior Design – I was able to really explore this visual inclination for colour and design. I learnt about various types of fabric and fabric designers and of course the memories of Ella’s house came back. When I got married some 10 years or so later – my dear friend Beck who I had met studying interior design gave us a fabric covered canvas in Unikko – undisputedly one of Marimekko’s most famous designs. Of course it was one of my favourite gifts and has had pride of place in the lounge ever since. Marimekko was founded in 1951 by Finnish couple, Armi and Viljo Ratia. Armi commissioned some of her artist friends to apply their graphic designs to textiles and design fabric prints for their company, which resulted in entirely new, boldly coloured and patterned fabrics. Still around today – Marimekko is without a doubt one of my all time favourite things – there’s something about it that definitely makes my heart sing and when my heart is singing, I am happy. A few years ago now – I was lucky enough to spend 7 weeks traveling around Spain. I stayed with lovely old friends in Toledo about one hour south of Madrid and used them as a base from which to travel the country right up north as far as Sans Sebastian and way down south as far as Granada and pretty well all around the perimeter of the country – what an amazing journey! Of course being the foodie that I am – I was in heaven and could quite easily eat everyday little morsels of delicious tapas washed down by lots of lovely vino blanco and cervesa. Lucky for me, I was mainly backpacking around – so all that walking in the hot summer sun carrying my massive backpack – helped me walk off my indulgence. On one of my first mornings in Toledo my lovely friend Marisa woke me for El desayuno with fresh café con leche and la Magdalena. What a treat! Magdalena or madeleine’s as they are also known are a dainty cup cake recognizable by their distinctive pointed shape. 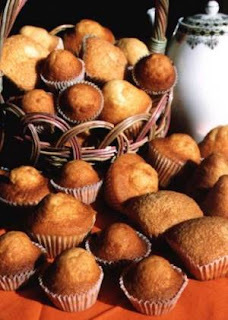 They are traditionally eaten in the morning and are bought in big bags from the supermercado like we might buy crumpets or muffins. Once I got over my momentary shock at eating cake for breakfast – I decided that this was pretty good really and la Magdalena became a definite breakfast staple. I’m not a girl who wears a lot of make-up. I dabbled as a teenager and occasionally in my 20’s but really – I am a bare minimum natural kind of girl. So to have found a cosmetics brand that really works for me and makes it kind of easy and straight forward to implement my daily routine – MAC takes the cake. About 10 years ago when I was in full swing of the city working girl lifestyle (train to work and often taxi home, out for coffee breaks during the day with colleagues, café lunch and a spot of shopping and then drinks and sometimes dinner after work with friends) – I was invited by a girlfriend to attend a MAC Cosmetics workshop after work one evening. They held it in her office and plied us all with free champagne and nibbles (very clever)…..I took up the offer of a free make over demo (I’d always wanted to have this done but was reluctant at Department Stores for fear of being sucked into buying everything they used and then never actually using it myself). The makeup artist was fabulous – and within a very short time had worked out exactly the right colour palette for my skin type and tone and had made me up in a very natural and yet complimentary way. From that night on – I have been pretty well consistently brand loyal. I spend less than $200 a year with them and the products I buy seem to last incredibly well. For a girl who doesn’t really wear makeup – I’m happy. And if you are the kind of girl who does wear makeup – or anywhere in between for that matter, they come highly recommended from me.